It is hard to say whether the amount of Revere Ware on Ebay keeps growing because there are more people interested in Revere Ware or more people are using Ebay overall. Our tracking continues to show the amount of Revere Ware related listings on Ebay increasing steadily. 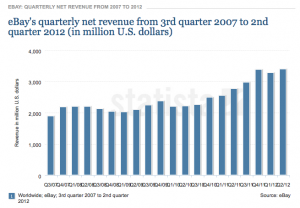 In the last 3 1/2 years, Ebay’s revenue has increased about 50%. Clearly people are using Ebay more and more and a rising tide usually affects all boats. 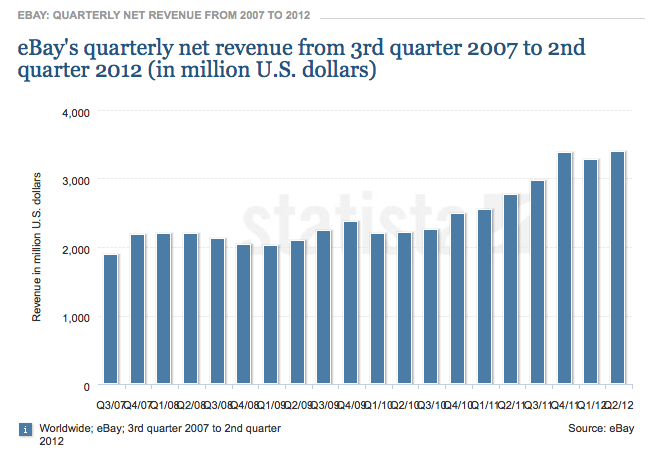 But Revere Ware listings have increased by about 200%, clearly outpacing the growth of Ebay sales. It seems likely that an overall trend of increasing participation in Ebay is helping the Revere Ware listing growth, but it also appears that people are listing more Revere Ware overall.